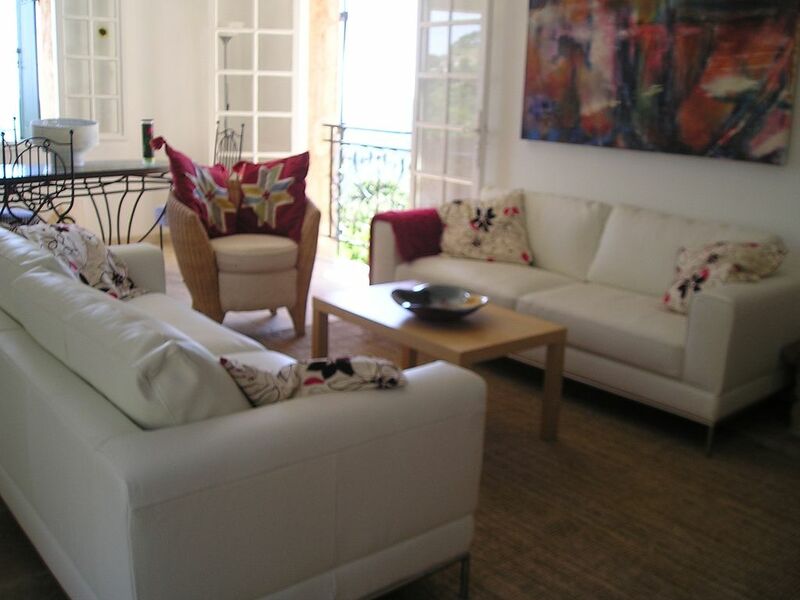 Recently refurbished edge of village villa with 4 beds and 3 bath, sleeps 8. 5 minutes walk into self sufficient village with butchers, bakers, mini supermarket and 6 restaurants. Stunning views over hills down to St Tropez coast line. Private pool with heating. 20kms from St Tropez and beaches. 5km from Grimaud. Bath 1 en-suite to bed 1 with shower, wc. Bath 2 bath/shower, wc between bed 2 and 3. Separate WC between bed 2 and 3. Bath 3 en-suite to bed 4 bath/shower, wc. Living room/dining room open plan. Sofas, armchairs, dining table and seating for 8, TV, DVD, CD, Freeview TV, fireplace. French doors to outside decked terrace area. Beauvallon & Gassin golfcourses within 1 hours drive. Outside: Several terraces all with views. Outside decked area on sitting room level with BBQ and dining table and chairs. Private pool which can be heated surrounded by patio area. Utility Room: Washing machine, drier, fridge/freezer. Cleaning / Towels / Linen / Maid service: Towels and linen included. Weekly change. Mid stay clean for 2 weeks. Extra Cleaning and babysitting by negotiation. English Caretakers. Other: Poolside sitting room. Sofas, board games, TV and video. Had a wonderful stay as a family. Well appointed, close to village and a great view. Just need a good coffee maker - essential to have with the delicious croissants we got from the baker each morning. Thanks for the fab feedback. We'll look into it ! We were 7 persons from 5 to 70 years and we had a wonderful time. This house suited us very well, a well equipped kitchen, good layout of the tree bedrooms, and lot of toys for the pool. There was a nice area right outside the kitchen which isn´t showing on any photo. Here was a table for dinner, patio set and a grill. For information I want to tell that the shallowest part of the pool are 90 cm and quickly gets deeper, maybe not so good for small children. The distans to village center is 1 km. Denne bolig kan det hele!! Dejligt hus, dejlig beliggenhed, dejlig udsigt, - perfekte rammer for en dejlig ferie for hele familien. Her er plads til alle og huset er rigt udstyret til både hygge ved poolen eller afslapning i skyggen eller gode timer i køkkenet. St Tropez and beaches 20kms. Nice 1 hr 15mins drive. TGV Les Arcs Station 45mins drive. 5 minute walk into La Garde Freinet. La Garde Freinet is a self sufficient village with boutiques and restaurants along with bakers, butchers, bank with ATM and mini supermarket. It is a village of great charm lived in by locals the year round. Booking Notes: 25% deposit at time of booking. Balance to be paid 6 weeks before arrival. Booking confirmation by email. Fully refundable damage deposit required. Changeover Day: Flexible except during July & August Saturday changeover. Will accommodate where possible. Notes on prices: If pool heating required £100 extra per booking paid on booking.